Keith Haring was born in 1958 in Reading, Pennsylvania. From a young age he enjoyed drawing, especially Disney characters and other cartoons. He initially wanted to become a commercial artist but after a year at the Ivy School of Professional Art in Pittsburgh, Haring dropped, moved to New York City and enrolled in the School of Visual Arts (SVA). Haring immediately felt connected to the thriving alternative arts scene happening downtown in the late 1970s and became friends with Jean-Michel Basquiat and Kenny Scharf. Inspired by the ideals of “art as life” and moving the art experience out of galleries and into the streets, Haring’s first major works were his subway drawings. 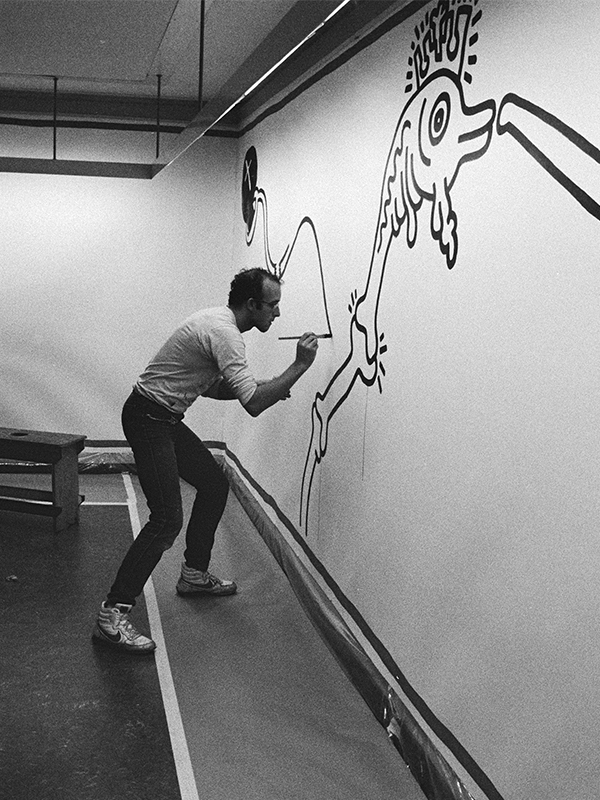 Haring produced over one hundred of these public works between 1980 and 1985, integrating his now-iconic exuberant, cartoonish outlined figures into everyday public space in a way that directly engaged its viewers. Haring recalled that the most important aspects of these works was the immediate engagement people had with them, asking him “what does it mean?” and giving him feedback that he’d then incorporate into future drawings. In this way, these works became reflections of the people who viewed them, responsive to and in dialogue with their environment. These works quickly garnered the attention of tastemakers in New York and his first solo exhibition was held at Westbeth Painters Space in 1981 and a celebrated show debuted at the high-profile Tony Shafrazi Gallery in New York the following year.